We understand that everyone has a different set of needs. So our villages have an extensive range of living options, ensuring you can live life to the fullest with the support that’s just right for you. Your living choice can be easily determined by whether you are looking for an independent lifestyle, or whether some level of assistance with living could enhance the way you enjoy life. Due to the popularity of our villages, the availability of our various living options within our many Metlifecare villages change all the time – to provide you with accurate costs and availability please talk to the village you are interest in direct. Our independent living options are designed for residents who are still active, able and live independently. 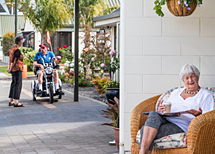 Residents have all the comforts of home while enjoying the companionship, social life and security that comes with being part of a thriving village life. Across our villages, residents live independently in villas, apartments, townhouses and cottages. We offer various levels of care and support, depending on the village and your needs. Our aged-care assistance ranges from Serviced Apartments, plus Rest Home and Hospital options in our Care Homes. Assisted Living options, also commonly known as Supported Living, are designed for residents who require regular support with daily tasks. To cater to individual needs, this level of support can be varied from basic assistance with meals, laundry and cleaning, right through to residential hospital level care, depending on the village. Everyone is treated with the utmost dignity and respect. With a choice of living options at many of our villages, you can stay close to your spouse or partner if your care needs are different. Our serviced apartments are for residents who require extra assistance with day-to-day living, while still enjoying their independence in the privacy of their own home, which is a more manageable size. Serviced apartments come with additional convenient services such as meals, cleaning and laundry. In some of our villages, these apartments may be referred to as Support Living Apartments. Our care homes offer rest home and hospital level care where residents have access to 24-hour care in a safe and comfortable environment with a team dedicated to their wellbeing. At a Metlifecare care home your family member is treated as an individual and with dignity. We work with our residents to reach their goals and provide ongoing assistance with their daily activities. If you are considering a higher level of care in a rest home or hospital, the Ministry of Health’s Residential Care Subsidy (funding) may be available to you in a number of Metlifecare’s Care Homes. *Not available in all villages. At Metlifecare, we’re here for you.